Since its beginnings with the ancient Greeks, the history of theater has been closely tied to the Italian territory and artistic movements. In fact, the country boasts an amazing amount of theatrical buildings, whether ruins, functioning venues (both old and modern), and studio halls. In addition, Western theater developed and expanded considerably under the Romans, and was later marked by Italian movements such as the Commedia dell’Arte, the origins of the Opera and the blossoming of the Renaissance. Before embarking on our off-the-beaten track journey around Italy’s lesser-known theaters, we feel the duty to spend a few words on the most renowned ones – after all, they have played a fundamental role in the history of sound and drama. Teatro alla Scala in Milan was inaugurated in 1778 thanks to Austrian Empress Maria Theresa, after a fire destroyed the previous theater, the Teatro Regio Ducale, in 1776. The new theater was built on the former location of the church of Santa Maria alla Scala. This is where Giuseppe Verdi and Giacomo Puccini debuted, and most of the finest operatic artists, singers and dancers from around the world have appeared at La Scala during the past 200 years! In Venice, Teatro La Fenice stands proudly with its tough history of fires that brought it to the ground three times (in 1774, 1836 and 1996). Especially in the 19th century, this opera house became the site of many famous operatic premieres by the major bel canto composers, including Rossini, Bellini, Donizetti and Verdi. If you are visiting Rome and you love opera and ballet, then you cannot miss the majestic Teatro dell’Opera. It held many world premieres of operas, including Cavalleria rusticana by Pietro Mascagni in 1890 and Tosca by Giacomo Puccini in 1900. The outdoor theater at the Baths of Caracalla (pictured above), with the Roman ruins as the backdrop, is the venue for the opera company’s summertime presentations in Rome. Commissioned by the Bourbon King Charles VII, Teatro di San Carlo in Naples was opened decades before La Scala and La Fenice, in 1737. This opera house is the oldest active venue for public opera in the world, and its architecture is simply breathtaking! Città della Pieve is a lovely medieval town in Umbria, located on a hill overlooking the Val di Chiana. Its ancient city center treasures the Teatro Comunale, also known as Accademia degli Avvaloranti. In the words of the International Opera Theater: “Teatro Comunale di Città della Pieve stands today as one of the most beautiful small theaters in all of Italy”. Apart from its physical beauty, this theater played an important role in the development of local history, culture and art. In fact, its origins date back to 1590 when locals created a literary academy to express their views. This academy decided to build a wooden theater in 1720, and eventually a brickwork theater between 1830 and 1834, on a neoclassical design by Giovanni Santini, one of Umbria’s most renowned architects. More recently, a ten-year restoration began in 1990 under the meticulous hands of local artisans, Antonio Marroni and his son Mario – once again showing the town’s affection and dedication towards the historic theater. The Teatro Comunale hosts a lovely painting by Umbria-Marche painter Mariano Piervittori portraying the famous Perugino (who, by the way, was born in Città della Pieve), his wife and a group of students, among which Raffaello. 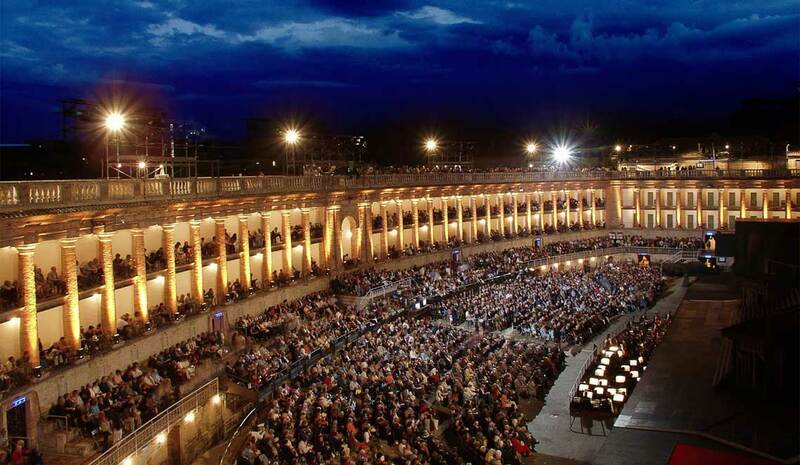 The neighboring region of Le Marche is home to one of the most striking open-air opera houses anywhere! The Sferisterio was initially planned in 1823 as a stadium for an ancient Italian national sport called Pallone col bracciale, a game that dated back to the 15th century and was the most popular sport for almost 500 years. 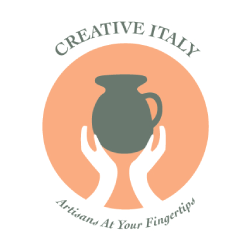 Local private citizens of Macerata paid for the works through a fundraising campaign. Inaugurated in 1829, it hosted sports events and circus shows for 91 years, until in 1921 it staged its first opera, Verdi’s Aida. It became an established opera house in the 1970s, and has been hosting the annual Opera Festival ever since. The Sferisterio of Macerata stands out as one of the most prominent architectural structures of the late European Neoclassical Style. The straight side of the arena is a wall 18 meters high and 88 meters long, along which are arches separated by 56 columns carrying a double row of boxes, and a stone gallery. The stage is 14.5 meters deep and 40 meters wide. Down south, sunny Palermo is home to Italy’s largest theater, Teatro Massimo, which is also the third largest opera house in Europe. The building will not only delight your ears (it is renowned for its perfect acoustics) but also your eyes: architect Basile designed the exterior in a high neoclassical style incorporating elements of the Greek temples at Selinunte and Agrigento, while the auditorium was conceived in a late-Renaissance style. If you have seen The Godfather Part III, you will recognize Teatro Massimo in its final scenes! Let’s cross the sea and reach Italy’s second largest island, Sardinia. Inaugurated in 1993, the Teatro Lirico in Cagliari does not have ancient origins like the other opera houses that we have mentioned so far. Nevertheless, it has been playing an important role in the local community, as well as at a national level. In fact, thanks to the quality and innovative character of its annual program and its own productions, the theater has received some important prizes. The theater filled the void left in Cagliari after the bombing of the Teatro Civico during World War II and the destruction of Politeama Regina Margherita due to a fire in 1942. 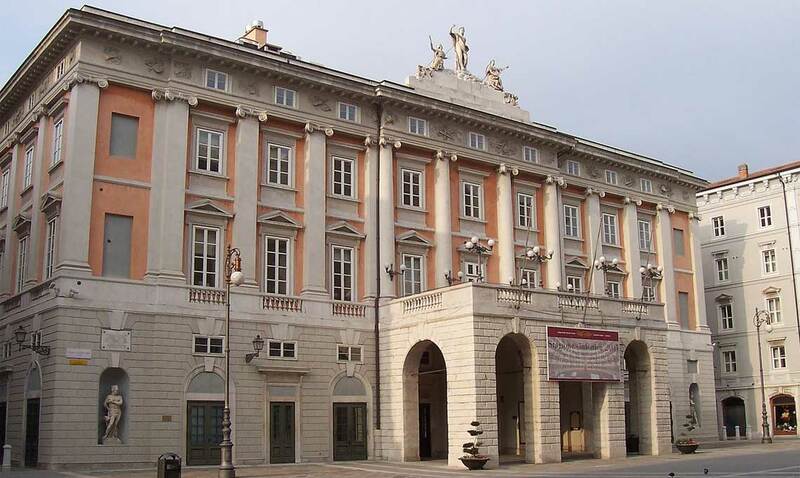 The beautiful town of Trieste in Friuli Venezia Giulia is home to Teatro Verdi. This theater is reminiscent, in some aspects, of its famous cousins in Venice and Milan: the original project and the interiors are by Giannantonio Selva, designer of La Fenice; while the façades are signed by Matteo Pertsch, who was a pupil of Giuseppe Piermarini, designer of La Scala. It was inaugurated in 1801 under the name Teatro Nuovo. Its name was changed different times as it passed from private to public ownership, until it was renamed one last time in 1901 just hours after the death of Giuseppe Verdi. The theater was the site of two Verdi opera premieres: Il corsaro in 1848 and Stiffelio in 1850, a production supervised by Verdi himself. Built in 1580-1585, Vicenza’s Teatro Olimpico was the final design by Italian Renaissance architect Andrea Palladio, and is today part of the UNESCO World Heritage Site for Vicenza and the Palladian Villas of Veneto. The Teatro Olimpico is one of only three Renaissance theatres remaining in existence (the other two are the Teatro all’Antica in Sabbioneta and the Teatro Farnese in Parma). The trompe-l’œil on-stage scenery designed by Vincenzo Scamozzi is the oldest surviving stage set still in existence. A true feast for the eyes and ears! 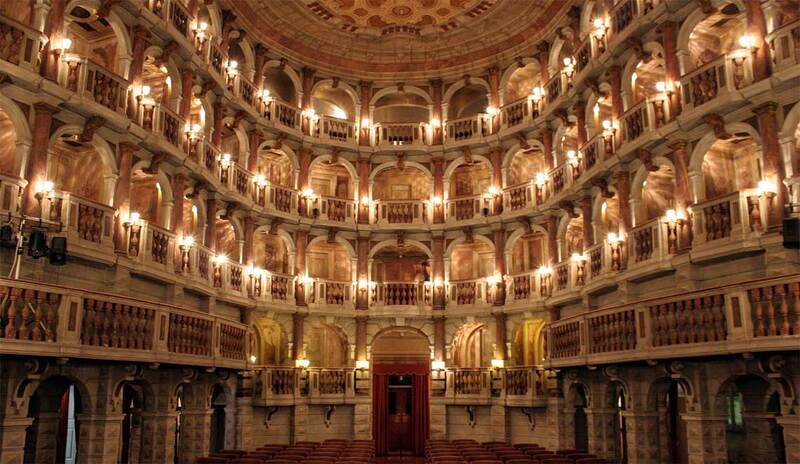 Teatro Bibiena in Mantua, Lombardy, is named after its architect, Antonio Bibiena – but is also known as Teatro Scientifico or Teatro Accademico. It was created in a late Baroque or early Rococo style, with a bell-shaped floorplan and four rows of boxes. Just days after its inauguration in 1769, the small theater hosted a concert by thirteen-year old Wolfgang Amadeus Morzart. Allegedly, his father Leopold Mozard wrote about the theater: “In all my life, I have never seen anything more beautiful of its kind”. Located in Florence’s historic center, Teatro della Pergola is a historic opera house that was built in 1656 under the patronage of Cardinal Gian Carlo de’ Medici. In this theater the great operas of Mozart were heard for the first time in Italy; and Donizetti’s Parisina and Rosmonda d’Inghilterra, Verdi’s Macbeth and Mascagni’s I Rantzau were given their premiere productions. Finally, it is considered to be one of the first examples of “teatro all’italiana” with its horseshoe-shaped auditorium with three rings of boxes, topped with a gallery. Declared a national monument in 1925, it today presents about 250 drama productions per year. Are you passionate about music, history, culture? Are you looking for an inspirational travel experience that entertains you but that also expands your knowledge? Enrich and rediscover yourself through your senses. Visit Italy’s most famous and lesser-known theaters, listen to and admire opera, comedy, drama and ballet on stage… and go beyond the obvious with Italian Special Occasions DMC. Plan your custom travel journey that includes exclusive access to the backstage areas; get to chat with the locals who have been working in the theater world for generations; visit the workshops that create (often by hand and through ancient techniques) costumes and props used during the shows. Recommended for: family and friend vacations/reunions, corporate outings. Contact us now.